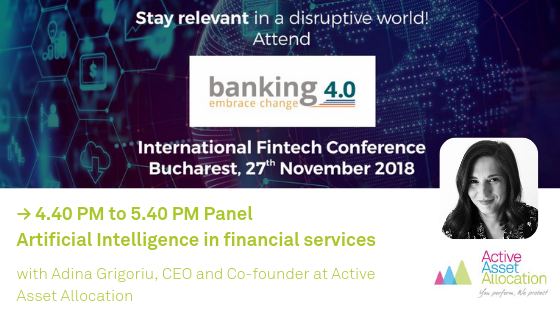 Nocash Events is hosting on the 27th of November 2018 a conference in Bucharest, Romania, to talk about moving fast-forward in the banking industry. Over 40 international specialists in the financial and payments industry will talk about top emerging technologies set to disrupt the banking industry, from Instant payments to Cyber security, Authentication and Biometrics, as well as Blockchain use in banking processes optimization, Artificial Intelligence and Conversational Economy. Participants to this event will learn all about the latest updates in the financial and payment industry, they will aslo have the opportunity to talk about business and exchange about their experiences. From 15.30 PM to 18:50 PM the participants will split to attend the various panels proposed on each subject : Blockchain, Cybersecurity, Instant and mobile payment, Authentication and biometry, Artificial Intelligence, and finally Open Banking.